A torque converter is a type of fluid coupling, which allows the engine to spin somewhat independently of the transmission. If the engine is turning slowly, such as when the car is idling at a stoplight, the amount of torque passed through the torque converter is very small, so keeping the car still requires only a light pressure on the brake pedal. If you were to step on the gas pedal while the car is stopped, you would have to press harder on the brake to keep the car from moving. This is because when you step on the gas, the engine speeds up and pumps more fluid into the torque converter, causing more torque to be transmitted to the wheels. The housing of the torque converter is bolted to the flywheel of the engine, so it turns at whatever speed the engine is running at. The fins that make up the pump of the torque converter are attached to the housing, so they also turn at the same speed as the engine. 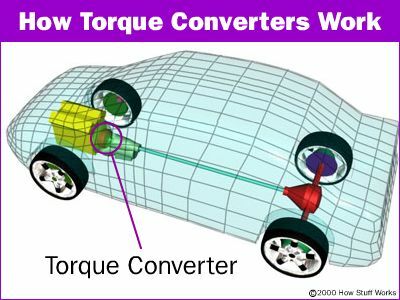 The cutaway below shows how everything is connected inside the torque converter. 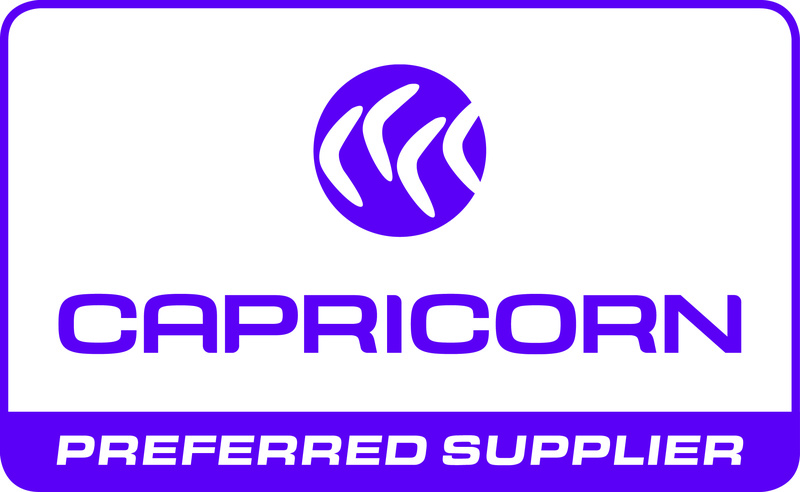 The pump inside a torque converter is a type of centrifugal pump. As it spins, fluid is flung to the outside, much as the spin cycle of a washing machine flings water and clothes to the outside of the wash tub. As fluid is flung to the outside, a vacuum is created that draws more fluid in at the center. The pump section of the torque converter is attached to the housing. The fluid then enters the blades of the turbine, which is connected to the transmission. The turbine causes the transmission to spin, which basically moves your car. You can see in the graphic below that the blades of the turbine are curved. This means that the fluid, which enters the turbine from the outside, has to change direction before it exits the center of the turbine. It is this directional change that causes the turbine to spin. 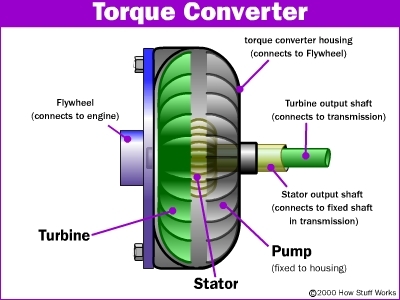 The torque converter turbine: Note the spline in the middle. This is where it connects to the transmission. In order to change the direction of a moving object, you must apply a force to that object -- it doesn't matter if the object is a car or a drop of fluid. And whatever applies the force that causes the object to turn must also feel that force, but in the opposite direction. So as the turbine causes the fluid to change direction, the fluid causes the turbine to spin. The fluid exits the turbine at the center, moving in a different direction than when it entered. 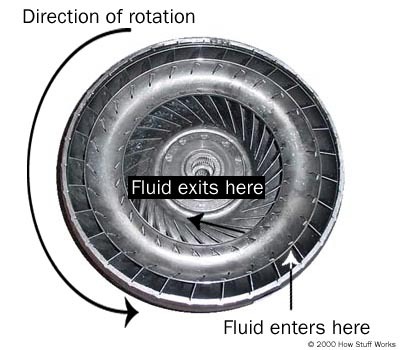 If you look at the arrows in the figure above, you can see that the fluid exits the turbine moving opposite the direction that the pump (and engine) are turning. If the fluid were allowed to hit the pump, it would slow the engine down, wasting power. This is why a torque converter has a stator. The stator sends the fluid returning from the turbine to the pump. This improves the efficiency of the torque converter. Note the spline, which is connected to a one-way clutch inside the stator. The stator resides in the very center of the torque converter. Its job is to redirect the fluid returning from the turbine before it hits the pump again. This dramatically increases the efficiency of the torque converter. The stator has a very aggressive blade design that almost completely reverses the direction of the fluid. A one-way clutch (inside the stator) connects the stator to a fixed shaft in the transmission (the direction that the clutch allows the stator to spin is noted in the figure above). 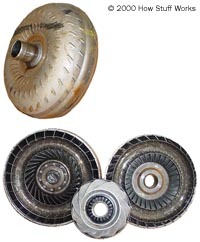 Because of this arrangement, the stator cannot spin with the fluid -- it can spin only in the opposite direction, forcing the fluid to change direction as it hits the stator blades. Something a little bit tricky happens when the car gets moving. There is a point, around 40 mph (64 kph), at which both the pump and the turbine are spinning at almost the same speed (the pump always spins slightly faster). At this point, the fluid returns from the turbine, entering the pump already moving in the same direction as the pump, so the stator is not needed. 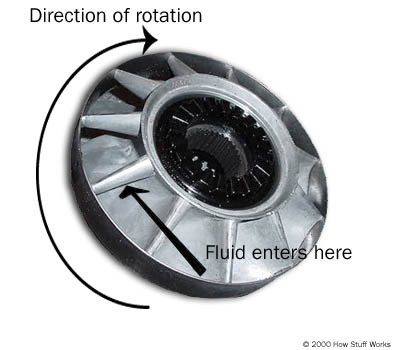 Even though the turbine changes the direction of the fluid and flings it out the back, the fluid still ends up moving in the direction that the turbine is spinning because the turbine is spinning faster in one direction than the fluid is being pumped in the other direction. If you were standing in the back of a pickup moving at 60 mph, and you threw a ball out the back of that pickup at 40 mph, the ball would still be going forward at 20 mph. This is similar to what happens in the turbine: The fluid is being flung out the back in one direction, but not as fast as it was going to start with in the other direction. At these speeds, the fluid actually strikes the back sides of the stator blades, causing the stator to freewheel on its one-way clutch so it doesn't hinder the fluid moving through it. At higher speeds, the transmission catches up to the engine, eventually moving at almost the same speed. Ideally, though, the transmission would move at exactly the same speed as the engine, because this difference in speed wastes power. This is part of the reason why cars with automatic transmissions get worse petrol mileage than cars with manual transmissions.